Homemade Garden Vegetable Cream Cheese is the star of this scooped bagel sandwich. It’s a perfect weekday breakfast, or serve it up for an easy brunch. When I was a kid, my dad would get up early on Sunday mornings and hit the deli for bagels, cream cheese, and all of the fixin’s. One of the stars of the show, as far as I was concerned, was the Garden Vegetable Cream Cheese. This wasn’t like most store-bought vegetable cream cheese. This deli made their schmear in-house, and it was packed with big pieces of bell pepper, carrot, and green onion. 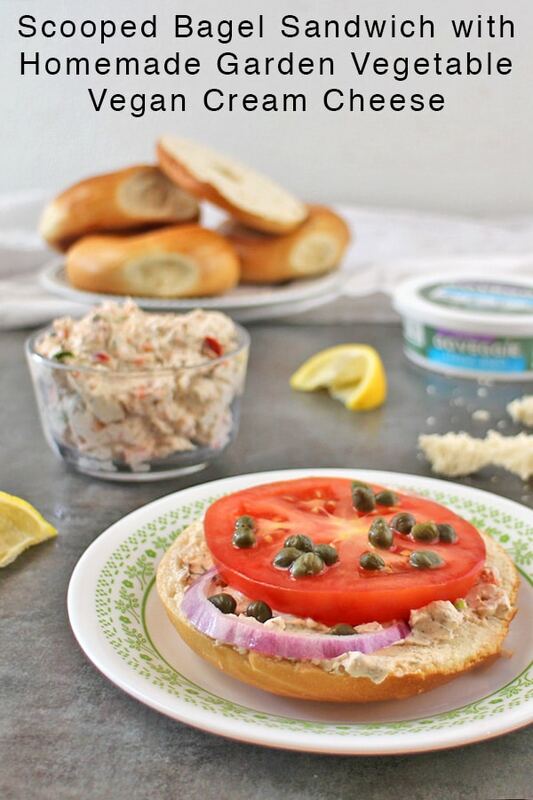 It was delicious on its own, but my favorite way to make it was on a scooped bagel with tomato and onion slices, a big scoop of capers, and a squeeze of lemon. Perfection. To make this Garden Vegetable Cream Cheese recipe, I started with an 8 ounce package of Go Veggie Vegan Classic Plain Cream Cheese. 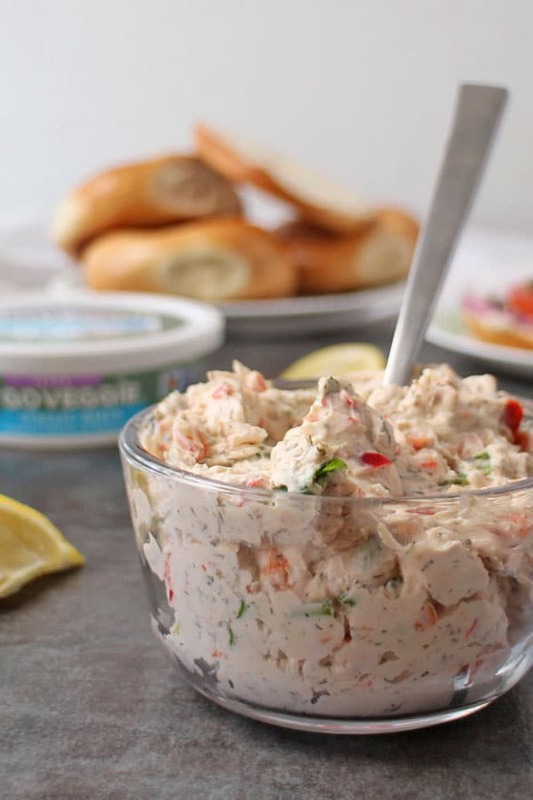 I know that vegan cream cheese can be tough to shop for, and I love how Go Veggie works in this recipe. Leave the cream cheese out to soften a bit while you prep your veggies. Finely chop your carrots, green onions, and bell peppers. You can do this in a food processor, if you prefer Then fold the cream cheese and veggies together with a little bit of dried dill. Add some salt and pepper, if that’s your thing, and you’re ready to spread! You can make your Garden Vegetable Cream Cheese up to two days ahead. I think it actually tastes better the next day, as the flavors get a chance to meld. Just store it in an airtight container in the refrigerator. I do not recommend freezing, because the veggies are not going to be a pleasant consistency when they defrost. They have a lot of vegan products at this point! I’m a fan of their cream cheese and Parmesan. 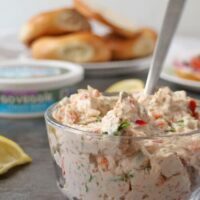 Go Veggie Vegan Cream Cheese would work well with my Easiest Vegan Cheeseball Ever and Vegan Cherry Cheese Danish recipes, too! You can see which of their products are and are not vegan on their products page. Vegan Go Veggie products have the purple banner on the label, so they’re easy to spot on store shelves. 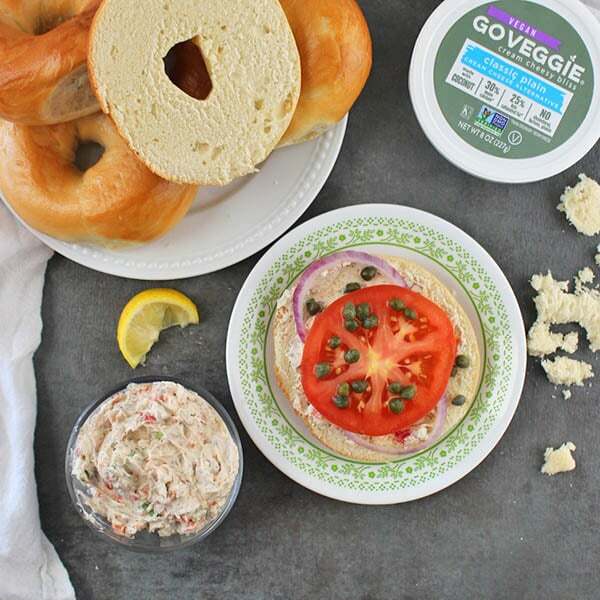 I’ve got a video and written instructions for the Garden Vegetable Cream Cheese below, but before we get to that, let’s talk about a critical step: scooping that bagel! I come from a family of bagel-scoopers. We are firm believers that scooping is the only way to get the correct bagel-to-toppings ratio. To scoop your bagel, just use your fingers to scoop that extra dough out of the bagel, creating a moat to hold more creamy, delicious cream cheese and veggies. Homemade Garden Vegetable Cream Cheese is the star of this scooped bagel sandwich. It's a perfect weekday breakfast, or serve it up for an easy brunch. In a medium-sized bowl, soften the cream cheese with a fork. Stir in the rest of the cream cheese ingredients, until they're well-combined. Refrigerate while you prep everything else for the bagel sandwiches. To make 1 bagel sandwich: Divide the cream cheese between the scooped bagel halves. Add 1-2 rings of onion, then top with 1-2 tomato slices each. Spoon on 1 tablespoon of capers per bagel half, then squeeze the juice of 1/4 fresh lemon on top. Family style: If you prefer, you can do like my family did on Sunday mornings, and just set everything out on the kitchen table. People can use the toppings to build their own best bagel sandwich. I highly recommend using a food processor to mince the carrots and bell peppers for this recipe. Your food processor will get those pieces much smaller. I used my mini Cuisinart for this, and it worked great! If you're not crazy about capers, you can omit them. Irving loves bagels with cream cheese! He would love this! I’ve never seen Go Veggie cream cheese here. I might have to make my own version with cashews as i’m not a fan of the Daiya one that I can get. Love the flavours and the capers. I’ll have extra of those! Veggie cream cheese is my favorite! And using Go Veggie as a base makes it’s so super easy. Love it! I’ve never heard of bagel scooping either! My mom used to always scoop the bread when she made sandwiches with an Italian-style loaf. (I loved being the person who would eat all of that “extra” spongey bread.) I can see how it would make a lot more room for your delicious vegetable cream cheese! I’ll try it next time! Ooh scooping Italian bread is a great idea. Anything that makes more room for toppings! Mmm, I have not had a veggie cream cheese in SO LONG – it used to be my favorite! 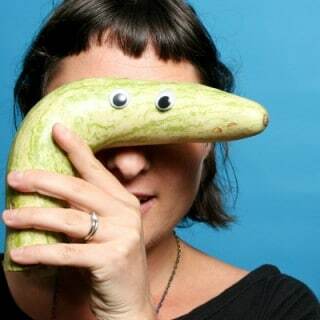 definitely making this one soon. Go Veggie is my favorite vegan cream cheese! But I have to say, I have never heard of scooping bagels before! I’ll have to try that. Ooh you’re going to love scooping! More room for a million toppings! I love a good bagel sandwich, and this one looks so good! Adding your own veggies to store-bought cream cheese is genius!